It's officially summer! That means I have beaches and parties and barbecues and sun to look forward to! 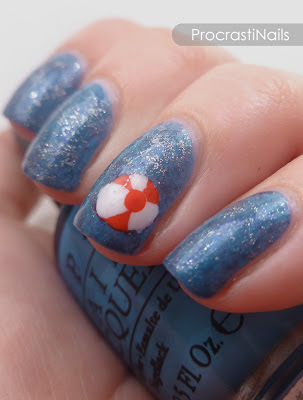 In celebration, I'm starting the Step into Summer Challenge for June and July that's being hosted by the Hobby Polish Bloggers group that I'm a member of. Exciting! Check out the Inlinkz list at the end of the post to see all the other great fills so far! I like this challenge because you can do all or some or even just one of the prompts created by the group. They're also really general prompts, so there's lots you can do with them. 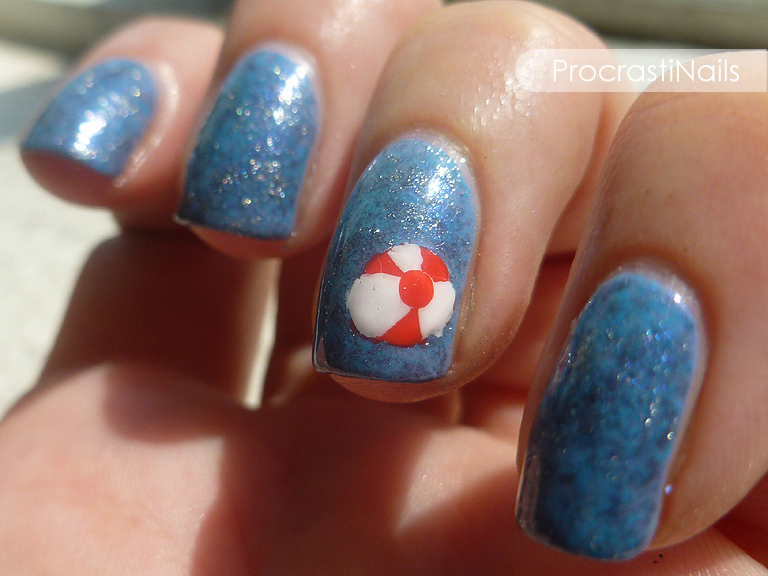 I decided to start with "Inspired by the Pool," which I did by doing a saran wrap style mani with a few shades of blue.That's my pool water! 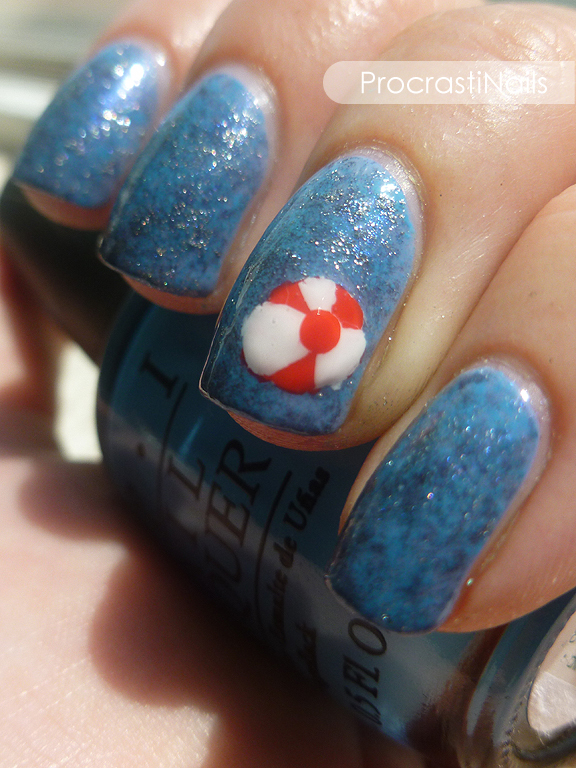 I put a little bit of silver on at the end to imitate the sun bouncing off my nail pool, and then added a beach ball to finish it off and make it a bit more interesting. Simple, but cute! Here's the colours I used to get this look (L to R): China Glaze Fade Into Hue, OPI's Silver Shatter, Rimmel London French White Nail Tip Liner, OPI's No Room for the Blues, OPI's Into the Night and OPI's Red Lights Ahead... Where? The silver on top of the blue really makes it look like water, so pretty! Think you're gonna keep this watermark? What did you think about my blog? Any criticism is welcome! Such a beautiful and fun idea! 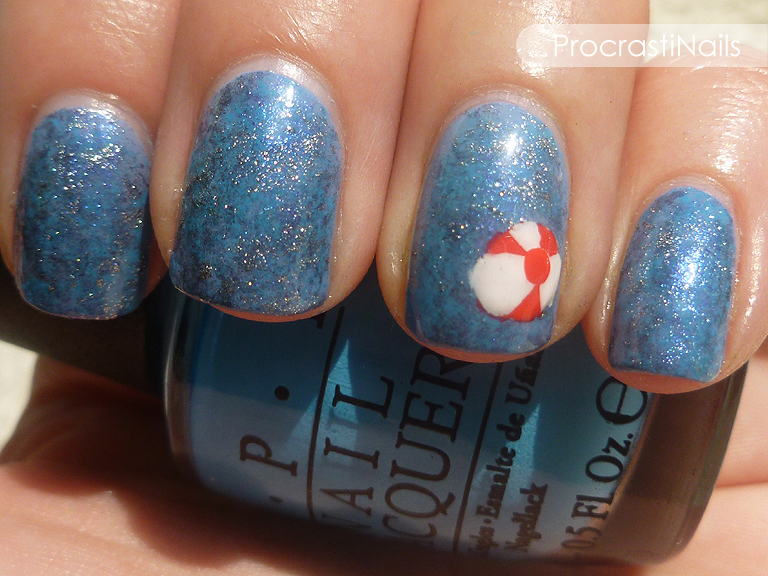 I love how the silvery marbled blue could be so multipurpose, but the beach ball brings the theme across wonderfully!